Dates are an important fruit, especially in many African, Middle-Eastern and Asian countries. In recent years this fruit has gained significant importance in terms of global commerce. During the period 1990–2009, global production of dates saw an increase of 219% and this trend is expected to continue as per FAO projections. Some of the major challenges confronting date fruit production and commerce are issues related to postharvest handling technologies, use of appropriate processing and packaging technologies, food safety aspects and quality assurance. Dates: Postharvest Science, Processing Technology and Health Benefits provides contemporary information that brings together current knowledge and practices in the value chain of dates, from production through to consumption. The important book published by Wiley Blackwell features coverage from leading experts on innovative processing technologies, packaging, quality management and pest control for dates. 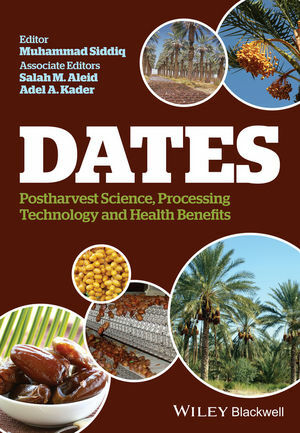 It is the only book to address the science and technology of the postharvest production of dates, a commercially important and growing sector of the food industry.